April Coolidge has been a truck driver for more than six years, and in October, she started to drive for Bentonville-based retailer Walmart. Coolidge has been a truck driver for more than six years, and in October, she started to drive for Bentonville-based retailer Walmart. She recently was named a 2019-2020 captain for America’s Road Team of trade organization American Trucking Associations and is one of four women captains on the team, which promotes the industry and safe driving. She’s also served on the Arkansas Road Team of the Arkansas Trucking Association and participated in its Arkansas Truck Driving Championship, hosted in Rogers. Coolidge, who lives in Mint Hill, N.C., recently spoke about her driving experience, the trucking industry and a report on women being safer drivers. “I feel that women probably are more cautious, and they don’t tend to take as many chances as men,” said Coolidge, adding that behind the wheel, women put more thought into what they’re doing and aren’t as aggressive as men. In its third iteration, a study completed by the American Transportation Research Institute, the nonprofit research organization of the American Trucking Associations, shows men are less safe drivers compared to women, who comprise 6% to 8% of truck drivers. Men also were 20% more likely than women to be involved in a crash, 45% more likely to have an out of service violation and 11% more likely to have a moving violation. The report shows the findings demonstrate the value in recruiting and retaining more women truck drivers and can guide carriers in gender-specific training to better address driver issues. The report includes strategies to recruit women drivers: emphasize wages, benefits, women trainers, safe equipment and home time; and advertise the benefits of team driving. Women in the profession in 2018 earned about 67.4% of what men received, according to a report from the Bureau of Labor Statistics. The recent report compared the average weekly wages of men and women in the occupation of truck drivers and driver/sales workers. Men in the occupation earned $829 weekly, while women earned $559 per week. While on the Arkansas Road Team, Coolidge would often visit schools and speak to students about the trucking industry. She also plans to do that as a captain on the America’s Road Team. She was named to the team in January. “It was always a dream of mine to be on the America’s Road Team, and I worked hard and protected my driving record out on the road … So that I could be on the America’s Road Team,” Coolidge said. She has more than 650,000 accident-free miles and has had no crashes or incidents. She explained that the public isn’t aware of the responsibilities of truck drivers while on the road, and emphasized the importance of state and national road teams, such as America’s Road Team, to educate the public on truck driver responsibilities and what people can do to be safer drivers alongside truck drivers on the highway. Her first event as a road team captain will be in April, and she along with other captains, will visit high schools to speak to students about safe driving. When asked about how the industry can attract more women to it, she said that this America’s Road Team has an unprecedented amount of women captains who can be an example and a role model for women and show them they can be successful. “I just think that the trucking industry is such a great way to earn a living,” Coolidge said. “And it’s not only truck driving.” When visiting schools, some students have told her that they don’t want to be a driver, but there are many other opportunities in the industry, which is necessary for the economy. Before she became a truck driver, Coolidge was a real estate broker in Charlotte, N.C., and when the market bottomed out in 2008, she looked to another field. Her father had been a truck driver throughout his career, and he provided his family a good life, she said. Coolidge wondered if she could be a truck driver. She and her father would stop for dinner when they crossed paths on the road. She recalled one time they drove together. “It was kind of nice knowing that my dad was just right there next to me on the highway,” she said. Her father retired four years ago with 4.2 million accident-free miles after driving for Consolidated Freightways and YRC Freight. Coolidge said she loves the freedom of being a truck driver and how she can be her own boss. She’s responsible for everything she does, including picking up her load and delivering it on time. The most difficult part of the job is being away from her home and family. “The public doesn’t realize the sacrifice that drivers make to provide the goods and the services that people need and enjoy on a day-to-day basis,” she said. For the majority of her career as a truck driver, she was an over-the-road driver for Van Buren-based carrier USA Truck. 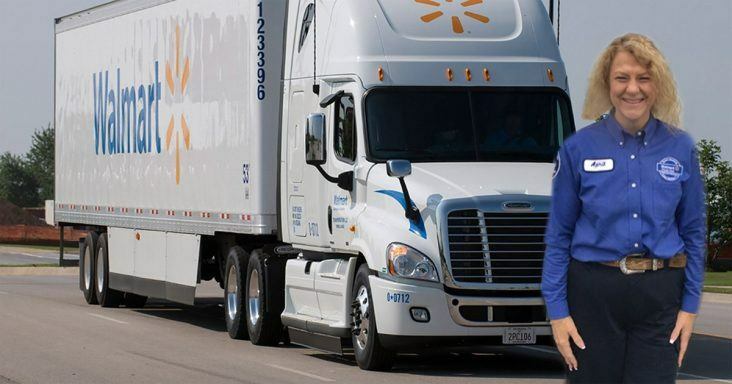 But as a regional driver for Walmart, she drives between 300 and 600 miles as an average length of haul, from distribution centers to stores, and is home two days a week. When she worked for USA Truck, she would be away from home for up to three months at a time, hauling freight from the Midwest up to the Northeast and participating in trucking events with the Arkansas Road Team and Arkansas Trucking Association.